Many thanks to Comment Central for coming up with this little gem: an oil company bragging about exactly how much ice they could melt in a day, were they to somehow put their evil minds to it. What a scale to use for comparison. 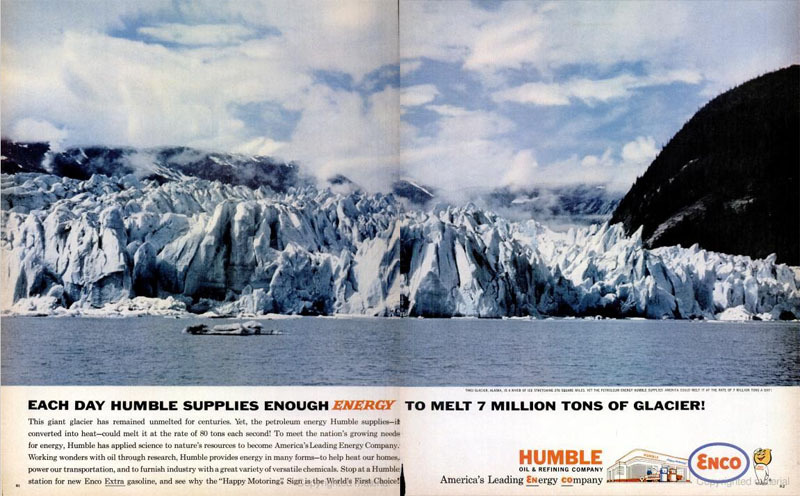 EACH DAY HUMBLE SUPPLIES ENOUGH ENERGY TO MELT 7 MILLION TONS OF GLACIER! This giant glacier has remained unmelted for centuries. Yet, the petroleum energy Humble supplies-if converted to heat-could melt it at the rate of 80 tons each second!